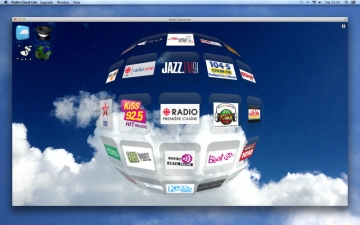 [無料] Radio Cloud Lite | Mac App Storeのアプリ検索・ランキング BuzzMac! Welcome to the next generation of radio. You won't believe your ears. 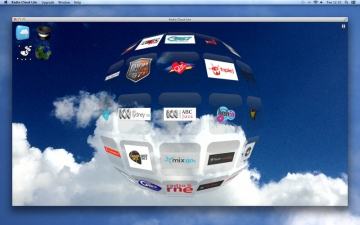 Radio Cloud Lite brings a revolutionary new way to listen to the radio on OS X. Featuring a stunning 3D user interface, radio stations appear to hover in front of your eyes. As you swipe your finger across the trackpad or magic mouse, one station fades out as another smoothly fades in, with no interruption in listening. No other radio app offers such an intuitive and natural listening experience. Supports fullscreen app mode. with more countries and stations to come in future updates. Please review Radio Cloud Lite if you wish to request particular stations or to offer suggestions for future enhancements. 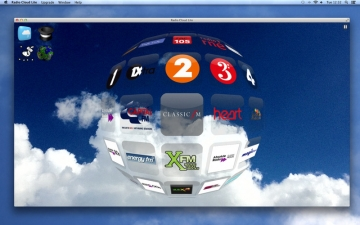 Download the full version, Radio Cloud, to remove ads and to select your preferred countries and genres from the menu bar to customise which stations are displayed. Also check out Radio Cloud for iOS bringing the next generation of radio to your iPhone, iPad and iPod Touch, available now on the App Store.